This adorable newborn gift for baby girls includes a pink baby blanket personalized with the girl’s name and birth date beautifully embroidered on the corner of the blanket. 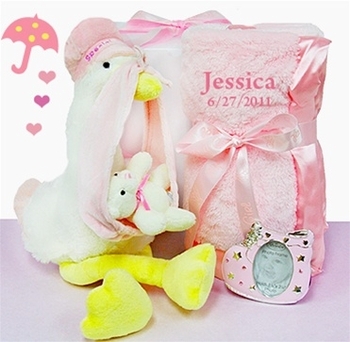 Also comes with a baby picture frame and super soft large plush stork in a lovely gift box! Super Soft Pink Blanket 30x40"